Send in news about your team and then see this featuring below, on your own team page and also on our facebook page. 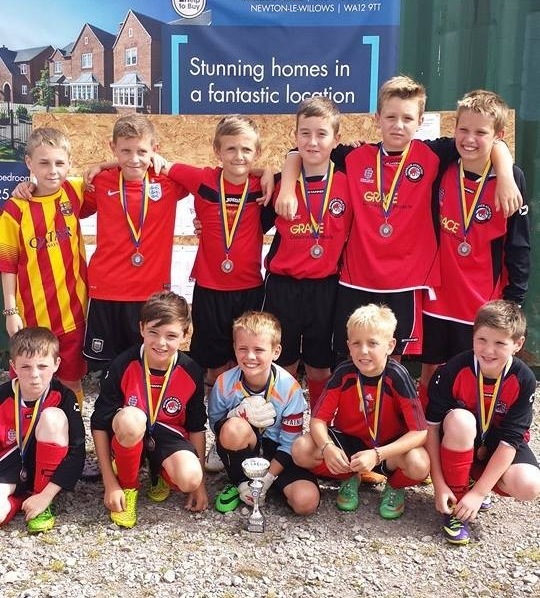 Winwick Hawks secured a hat trick of Tournament successes this summer of 2014 with a win at Newton-Le-Willows. Winning all of their group games (without conceding a goal), the solid defence of Louis and Cal and forward play of Reiss and Will contributed to a feast of goals. The Hawks played the hosts, Newton-Le-Willows Ace’s in the semi-final. In a close fought game, a goal from Adam after great wing play by Oliver in the last minute of normal time (1-1), took the tie to penalties. After 5 penalties each, in which Tom produced some excellent saves, the game was won in sudden death with Kyle coolly slotting his penalty home. In the final, the Hawks played Lymm and with goals from Jack C and Callum (2), they fought hard and deserved their 3-0 win to lift the Trophy. Another great team effort with all who took part showing composure on the ball and a commitment to their team mates. Well done.